On the hills of one tournament VSU golf is gearing up for their next outing. Located in Eatonton, Georgia, just under an hour and a half southeast of Atlanta, Cuscowilla provides a variety of holes in a picturesque setting, with lakes, pines, fescue, and sometimes massive red bunkers. 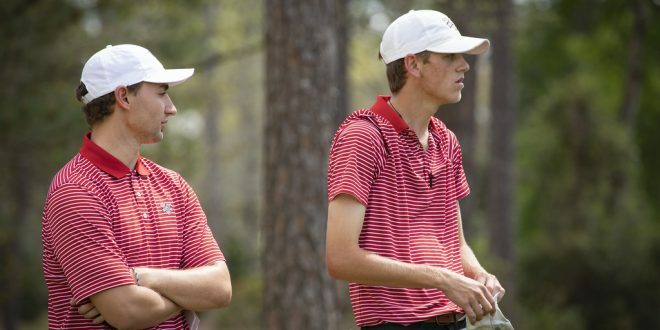 Following VSU’s home tournament earlier this week, Freshman Davis Smith said that both Cuscowilla and Pensacola will be crucial. Purvis will be going with his typical starting five for this event: Matt Anderson, Brock Healy, Gage Smith, Davis Smith, and Jordan Long. Anderson will enter play as the No. 28th-ranked player in Division II Golf, following a tie for 9th place finish at Kinderlow. Prior to this past week, the senior had a victory at the UIS Island Getaway to close the fall season and came in a tie for 2nd at the Saint Leo Invitational on February 26th. Among the trio of freshmen, Healy has played the best as of late, coming in ties for 7th and 15th at the Saint Leo and the Southeastern Collegiate respectively. He was the runner-up to Anderson at Rio Mar in late October. A par 70 that sits on Lake Oconee, Bill Coore and golf great Ben Crenshaw were the minds behind this layout. Relatively short at first glance, the many unique holes come out at different distances. While Holes 5 and 12 add excitement as drivable par 4s, the par 5 14th, one of only two on this track, is listed at a lengthy 614 yards and is considered the toughest hole, according to handicap. The par 3 11th, while only 125 yards, is one of the more interesting holes as it requires precise wedge play, given there’s water to the right, a bunker on both sides, and a ridge in the middle of the green that splits the putting surface into different sections. Most courses are predominantly tree-lined or open links courses, but Cuscowilla offers both. Some tee shots require the players carry over water, and avoiding hazards whether wet or sandy will be something to keep in mind. The holes themselves largely don’t demand tremendous distance, but keeping the ball in the fairway and away from the trees, hazards, and fescue will be greatly beneficial. Fittingly for a Crenshaw design, putting will also be a premium, something the two-time Masters winner was known for while playing on the PGA Tour. An Austin native, Crenshaw stayed in his hometown for college golf. As a member of the Longhorns, he played on three national championship teams from 1971-1973 and won the Haskins Award, the sport’s equivalent to football’s Heisman, in all three of those years. 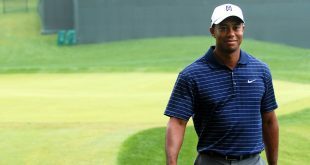 He then went on to have a Hall-of-Fame professional career, where he accrued 19 PGA Tour victories, including his Masters wins in 1984 and 1995. Both were notable for different reasons, but the 1995 event stands out as a historic emotional triumph. With his coach and mentor Harvey Penick’s recent death, Crenshaw arrived at Augusta the night before the tournament, following the funeral. Tied for the lead entering the final round, “Gentle Ben” posted a 4-under 68 to edge out Kinderlou designer Davis Love III by a single stroke. There are many great holes on this golf course, and Purvis couldn’t come up with a signature hole, but for me, a great element of the design are these potentially reachable par 4s. Following a two tee shots over water on 3 and 4, the 5th is distinguished by a giant red bunker that rests on the left side of the fairway between the tee and the green. For the players going for the green, they’ll have to carry it about 250 yards to get over it. Those looking to go the conservative route will have a fairly large amount of real-estate to the right side. If the player decides to play it short off the tee, an approach will require a shot into a green that features a shelf several paces away from the front edge. The 12th is perhaps more daring and a shade longer at 309 yards. Barring an unfavorable wind, the players should have an opportunity to go for it. In that case, the dogleg left forces the player to hit it over the tall pines to get it there, and a pair of sand traps protect the front of this particularly small putting surface. Written by Bryant Roche. Photo Courtesy of Blazer Athletics.